The bombastic play "Kaneiri Gedatsu no Koromo" was premiered in the 3rd lunar month of 1760 at the Ichimuraza. It was performed within the drama "Soga Mannen Bashira" and starred Ichikawa Danjûrô IV in the role of Akushichibyôe Kagekiyo. It went to oblivion and the original script was lost but it was nevertheless added to the Kabuki Jûhachiban collection of drama in 1840 by Ichikawa Ebizô V. It was revived in January 1914, in Tôkyô at the Hongôza [more details]. The new script was written by Yoshii Isamu. Another script was written by Yamazaki Shikô for Ichikawa Sanshô V in 1932. This version of "Gedatsu" was staged in November 1932 at the Kabukiza. Yamazaki Shikô's script was used for the revivals in October 1953 at the Kabukiza and in March 1954 at the Ôsaka Kabukiza. Yoshii Isamu's script was used for several productions by the Zenshinza in 1958 and 1959. It was also used for the revival in January 1992 at the National Theatre. The summary below was made using Yoshii Isamu's script. A newly-created drama, which was entitled "Kotohoide Mimasu Kagekiyo", was staged in January 2014 at the Shinbashi Enbujô and starred Ichikawa Ebizô XI in the role of the warrior Akushichibyôe Kagekiyo. This drama was created by mixing scenes and elements coming from 4 kagekiyomono belonging to the Kabuki Jûhachiban: "Kan U", "Kagekiyo" "Kamahige" and "Gedatsu" [more details]. This drama was also staged in September 2014 at the Minamiza. The scene is set in spring in the precincts of the Kiyomizu Temple in Kyôto. The audience can see on stage an ancient cherry tree and the impressive temple bell (tsurigane). Some bonzes try to stop the yakko Yamahei, who has brought with him a letter for the Heike warrior Akushichibyôe Kagekiyo. After the defeat of the Heike clan, Kagekiyo has taken up residence at the Kiyomizu Temple. The bonzes insist that Kagekiyo is out and that they will be punished if they allow Yamahei in. The yakko forces his way in and tells them that he will summon Kagekiyo by striking the temple bell. They answer that it won't work as the bell is silent. A memorial service has been held for the souls of the Heike warriors who died on the battlefield. Following this memorial service, striking the bell can't produce any sound. A woman's voice is heard calling to Yamahei. The bonzes are surprised and quickly say that the temple is strictly forbidden to any women. Akoya, Kagekiyo's lover, enters and enquires after Kagekiyo. She is the author of the letter for Kagekiyo. Anxious to see him, she has made her way to the Kiyomizu Temple. Akoya is a courtesan and she works in the pleasures quarter. She has another customer who is so jealous of Kagekiyo that he wants her to sever her relationship with Kagekiyo. Akoya could not bear the absence of Kagekiyo any longer and she has come here to search for her lover. She is told that that Kagekiyo spends most of his time either drinking sake or sleeping off a hangover. Today, he went out without telling any bonze about his destination. Akoya is finally allowed into the temple. The word is brought of the imminent arrival of an important Genji warrior named Kajiwara Heizô Kagetoki. Yamahei and Akoya are about to hide but they are stopped by the yakko Tanihei, who is at the service of Kajiwara. His mission is to help his master finding Kagekiyo. Tanihei and Yamahei fight and withdraw from stage. Kajiwara arrives and Akoya is surprised to see that he is her wealthy client, the rival in love of Kagekiyo. Kajiwara is equally surprised to see her. He complains that, despite his many visits to her, she has not once agreed to spend a night together. Kajiwara hopes that, with this unexpected meeting, she will be more accommodating. Akoya declares that Kagekiyo is and will stay her only lover. This is too much for Kajiwara who decides to imprison Akoya beneath the bell (kaneiri). Then, both Tanihei and Kajiwara hide and wait for Kagekiyo's return. Yamahei comes back on stage and, realising that Akoya has been trapped beneath the bell, attempts to raise it. Unfortunately, he is not strong enough. Even with the help of the bonzes he cannot raise the silent bell. They then notice the approach of what looks like a woman in the form of a snake. Fearing this blood-chilling apparition, they all hide. Ôzatsuma musicians perform on stage to announce the arrival of Kagekiyo. He enters disguised as a woman. He has stolen a kimono in a Kabuki theatre. The actor Sadoshima Chôgorô, enters on stage and asks Kagekiyo to return the kimono as it is his costume and he has to wear it on stage in the next play. Kagekiyo glares at the actor, who flees off stage. Kagekiyo raises effortlessly the bell and releases Akoya. The two lovers are reunited. Their discussion quickly shifts to the story of Kagekiyo's sword Azamaru. It is said that Kagekiyo has lost this precious sword. Kagekiyo wants to know how Akoya has heard of his search for the sword. He is shocked to hear that she was told by Kajiwara. Kagekiyo then claims that he has not lost the sword. He also claims that it has not been stolen from him as it is generally believed. In fact, he has given it away as collateral on a money loan he has made with a man named Kawachiya Denbê. The sword was the only way he could raise money in order to be able to drink every night and forget about Akoya and her rich customers like Kajiwara. At that moment Denbê, himself, arrives with the sword. He complains that, when he has drawn it to check it, everything went black and thunder and lightning have struck on all sides. Denbê wants to return the sword to Kagekiyo and get his money back, with interest to compensate the inconvenience he has suffered. Kagekiyo wants to check the authenticity of the sword but the terrified Denbê runs off. Akoya seems very interested in the sword. Noticing a barrel of sake, she proceeds to make Kagekiyo drink excessively. Offering him cups of sake, she asks Kagekiyo to tell her a story. He narrates a strange story which happened to him one night when he was tricked by a fox disguised as Akoya. Drinking and narrating his story, Kagekiyo finally gets completely drunk and falls asleep. The yakko Tanihei reappears on stage. He is actually Iba no Jûzô, the brother of Akoya. Together, they have plotted to get Kagekiyo drunk, then to steal the Azamaru sword. Despite Akoya's warning, Jûzô unsheathes the sword to verify its authenticity. There is a tremendous thunder and the two faint. Kagekiyo appears on stage. He understands the situation and is now aware of Akoya's treachery. Akoya has not realised that the sword was not the precious Azamaru, substituted by Kagekiyo, but a different one, and more powerful sword named Raimeimaru (literally the "Name of the Thunder" sword). Kagekiyo laments that he has been a slave to his primal instincts and that, instead of working for the revival of the Heike clan, he has allowed himself to become infatuated with a treacherous courtesan. As he is lamenting, a thunder bolt strikes the cherry tree and the real Azamaru falls out. The sword is immediately seized by Kajiwara. It is followed by a danmari involving Kagekiyo, Kajiwara, Yamahei (who is in reality Kagekiyo's retainer Tomo no Rokurô) and Jûzô struggle for possession of the swords. Finally Jûzô makes off with Azamaru with Rokurô in pursuit holding Raimeimaru. Kagekiyo then gives vent to his anger against Akoya. 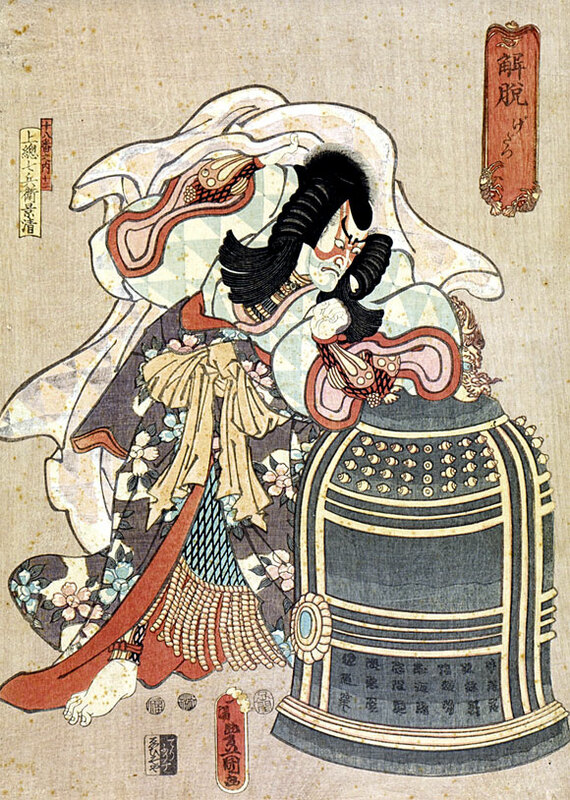 The unfortunate courtesan is imprisoned beneath the bell (kaneiri). Then, Kagekiyo mounts it, declaring that he is now released from earthly passions (gedatsu). Rokurô returns on stage, regretting that he was unable to retrieve Azamaru, but Kagekiyo tells him that he will no longer waste any time on such trivial contingencies such as the rise and fall of the Heike clan. From now on, he will be the holder of the thunderous Raimeimaru sword, meaning that he will be transformed into the God of Thunder. Kagekiyo is about to leave when Kajiwara and Jûzô return and bid him wait. Kagekiyo tells them that he has imprisoned Akoya beneath the bell and that a sign should be put up next to the bell to warn any visitor: access to the bell is strictly forbidden. Any attempt will end with the sudden death of the one touching the bell. Jûzô desperately tries to help his sister but Kagekiyo draws the Raimeimaru sword and Kajiwara, Jûzô and Rokurô fall to the ground. Kagekiyo is indeed the God of Thunder. He makes a bombastic leaping exit (roppô) through the hanamichi.